Explore the world of “kit homes” - the houses sold by mail-order retailers Sears Roebuck, Montgomery Ward, Harris Homes and others. 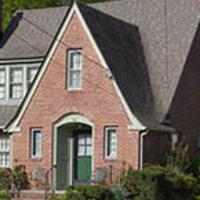 Kit homes were sold out of the pages of catalogs in the early 1900s. Sears alone offered more than 370 designs - everything ranging from Arts and Crafts Bungalows to Foursquares to Colonial Revivals. Sears homes came in 30,000-piece kits and were shipped to all 48 states – many in the Midwest. Day one (Friday) is the classroom presentation. On day two (Saturday), enjoy a two-mile walk through a nearby neighborhood to discover the kit homes hidden in plain sight in Aurora. Lara Solonickne is the creator of the blog Sears Homes of Chicagoland (http://www.sears-homes.com). She is an architecture enthusiast who enjoys uncovering the hidden stories behind old houses. She holds a degree from Northwestern University. I know this home in West Liberty is a Sears’s house in light of the fact that a more established occupant who knew the first proprietor disclosed to me that he recollected when it was assembled. Nonetheless, I am as yet endeavoring to decide the model of this home.